← Bacon Jam – too good to not pass on! Today’s kitchen experiment post was prompted by the weather outside. Yes, a lake effect snow taking place could prompt a recipe. I heard about this concoction probably like two years ago. I seriously thought to myself “Wha…? 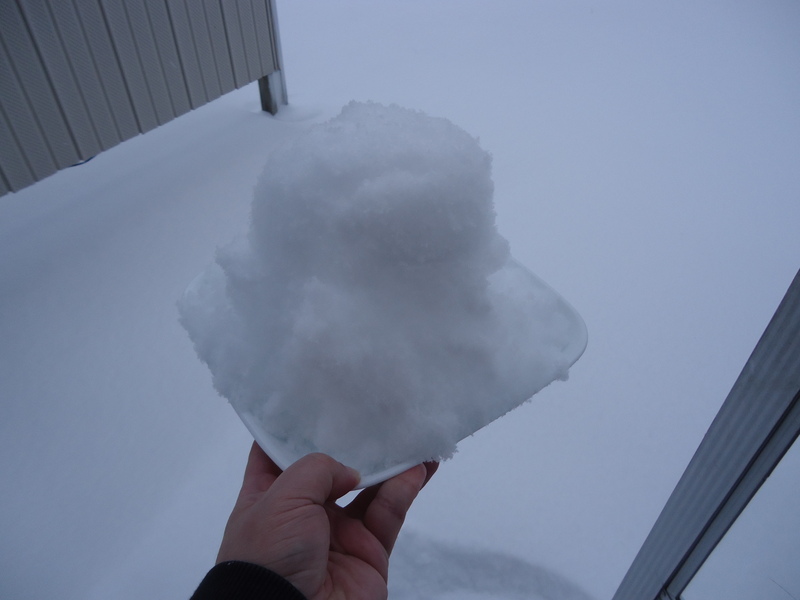 You can take snow and use it to make an ice cream dessert? ?” So yep. That’s where this started. Immediately I ran to the internets and researched the base recipes thinking I should have the ingredients on hand. Yes there is a requirement to have snow, real snow. But I thought I recalled that Sweetened Condensed Milk as another main ingredient. Now that could be true for some recipes. However, I personally took a moment to read the label on the can I had in the cupboard and nearly yelped aloud reading that one can contains 1300 calories. Thirteen hundred freakin’ calories!! Because of that, I immediately started thinking about how I wanted to make a lower calorie version that wouldn’t kill on calories and possibly be so overly sweet. Don’t get me wrong, I love sweet treats. But knowing how minimal the ingredients are, I thought “Screw it. I’m going to experiment.” And that’s where I ended up. Keep an eye out for fresh fallen snow. Now living in the great lakes region helps because we tend to get these snow bands that can drop several inches (or feet) over a short period of time. Raid the fridge and cupboard for flavoring stuff. Mix up the liquid flavoring. Blend together half the snow with the liquid. Once evenly blended, mix in the other half. And you’re done! Because I wanted to save on calories, I thought about how I needed to substitute the thickness of Sweetened Condensed Milk with something else. That’s where the Maple Cream came into mind. Luckily, I have a very dear man in my life that gave me some as part of my birthday gift recently and this was the perfect time to use some. 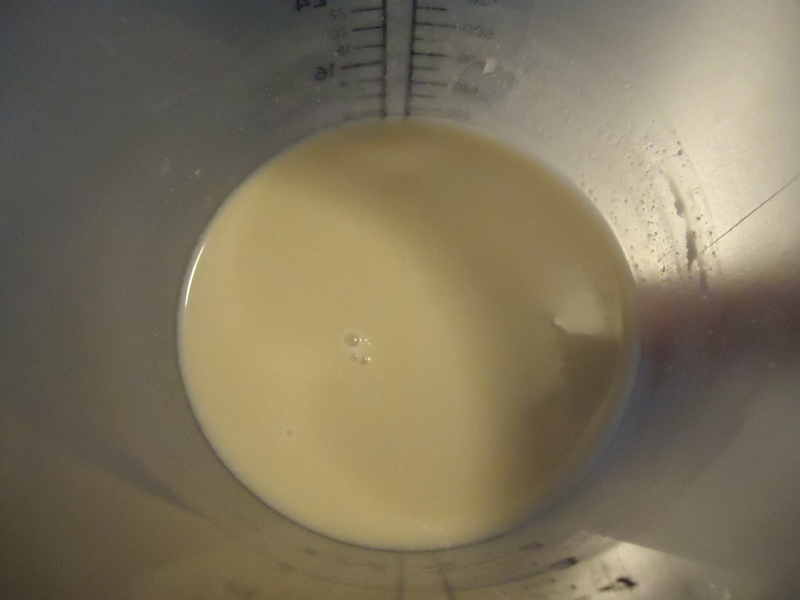 Granted the Maple Cream and Syrup were not going to be as thick as Sweetened Condensed Milk, but that’s okay. I want a light dessert, both calories and taste/mouth feel. And the Maple Syrup was because I’m a maple flavor lover/freak. It is probably one of my all-time favorite flavors right after Bacon. 🙂 I was also concerned about adding more flavor with quite as much sugar. Yes I know syrup is sugar but Maple Cream visually is whipped sugar and had me thinking more calories which is technically correct; see calorie info below. 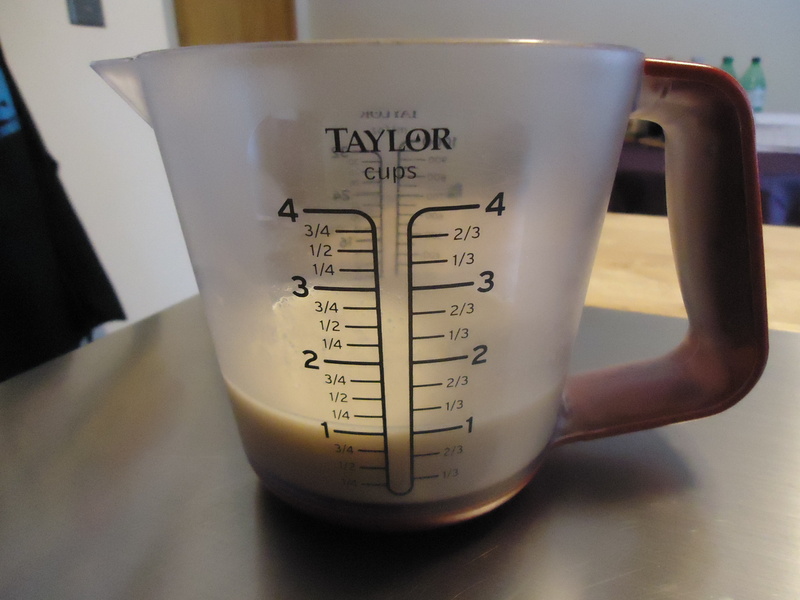 I mixed together the flavor ingredients in my measuring cup trying to work at creating roughly a volume of one cup total. This is where I was being specific in my measurements because I knew the more liquid, the loser the ‘cream’ would be in the end. 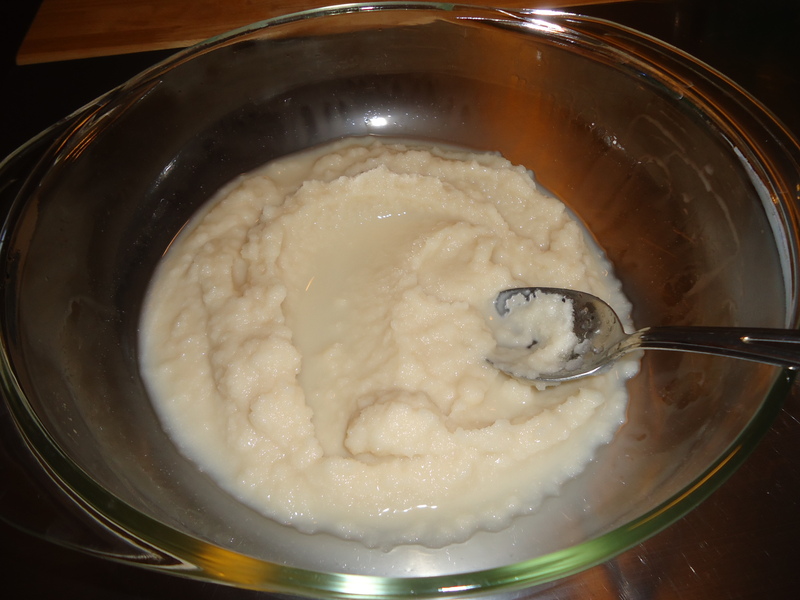 Here’s the flavorings evenly mixed together after using a whisk to make sure I got the sugar crystals of the Maple Cream to dissolve in the Coconut Milk. Also, I needed the Maple Syrup to dissolve out and make a nice blended flavor mix so that these ingredients would not separate out during the mixing process. Okay, so here’s the deal with snow. We had up to a 12 inches fall in the past day plus. Living in the Great Lakes provides some opportunities for ample snow fall. This is a view out the door off my kitchen onto my patio. 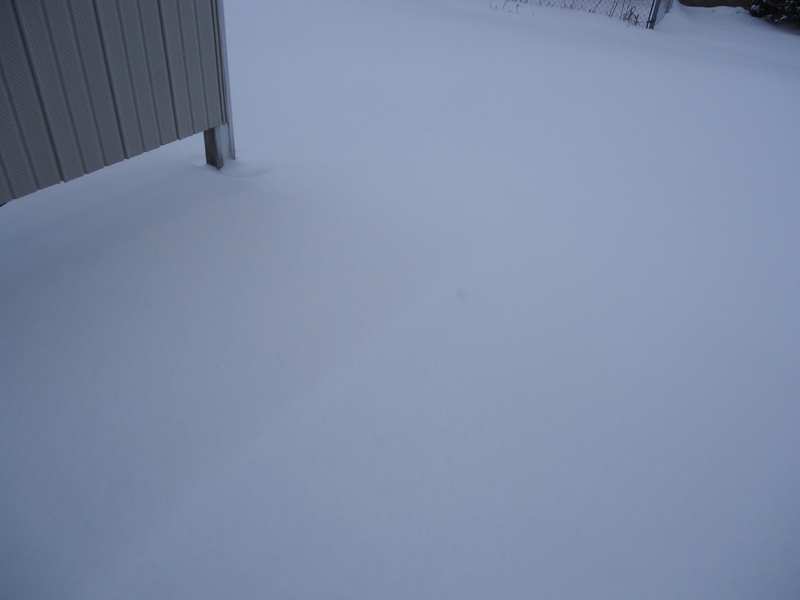 I would say there’s a good 8 inches of fresh white fluffy snow there. 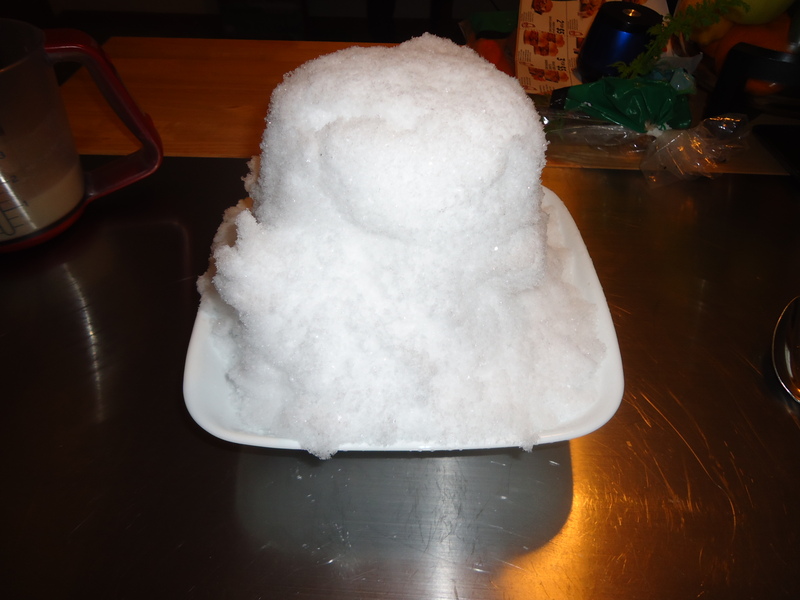 Now that I had the snow inside the kitchen, time was my enemy. Even though I had the thermostat set in the high 60s (because I don’t need to live in a tropical locale), I knew I had to move quickly with the next steps. 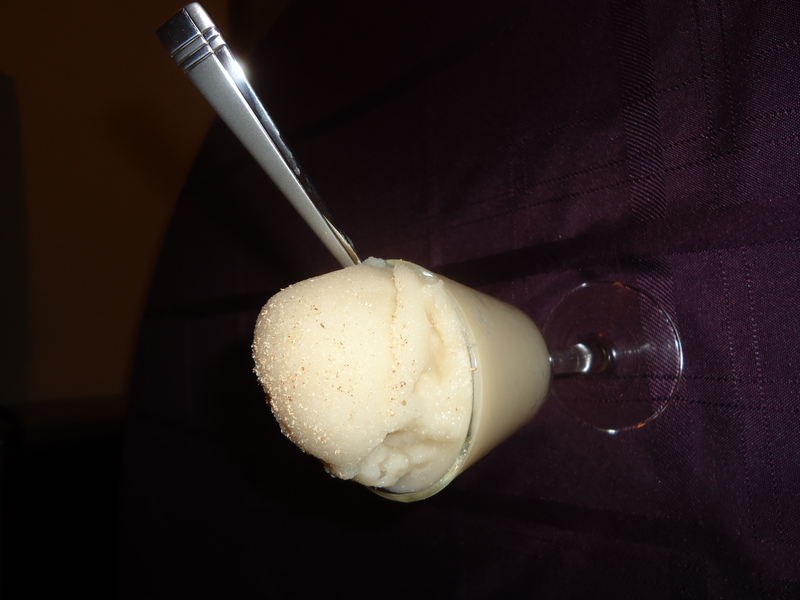 So we got two main ingredients now to bring together; the flavor liquid and the frozen water. 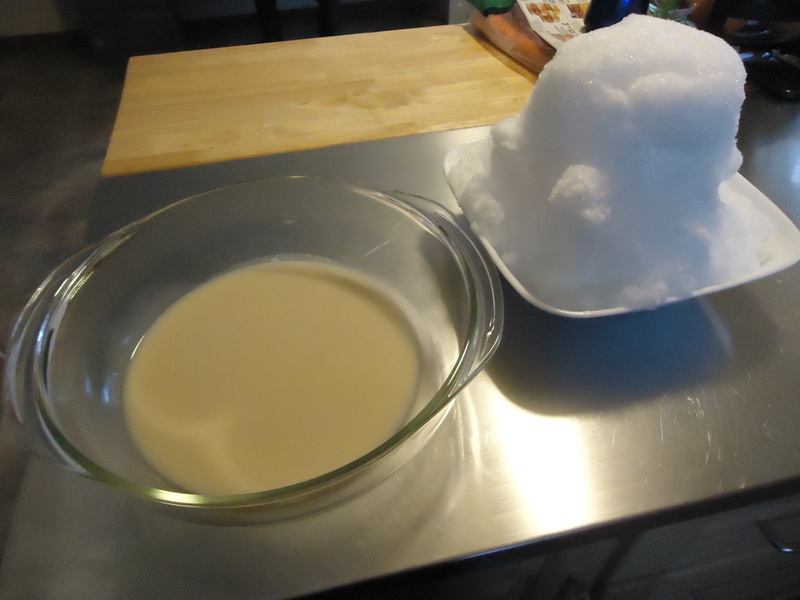 Here’s the first half of the snow mixed together with the liquid. Notice that there’s still some liquid while the snow is still keeping its texture. This is where you really do not want to blend a little at a time. By doing that, I think you would basically take forever to turn the liquid into a semi-solid. Here’s the remaining half of the snow ready to blend in with the first half already mixed with the flavoring. From here it was all about using my metal spoon (conducts cold best) to finish up getting a good, even blended end product. This is what it looked like after final hand mixing. Notice how the snow has definitely decreased in volume. That’s because of the air being removed as well as the snow crystals melting down a little bit. Now it’s all about serving! So in the end, I was pleasantly surprised how quickly this all came together and by far have a new winter treat favorite. In fact, I’m thinking about how I would need to live in certain locations in the future to be able to keep making this great dish. 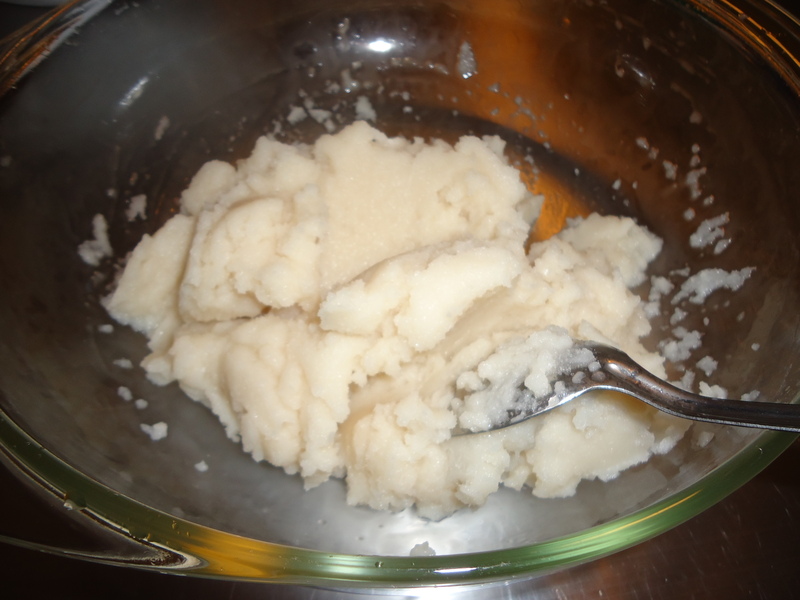 I placed the leftover snow cream in the freezer uncovered in a bowl so I can scoop more out later as I want in the next day+. I doubt it will last more than 36 hours…lol. Here’s the full recipe based on what I did in case you want to experiment yourself. Total is …. 325 calories!! 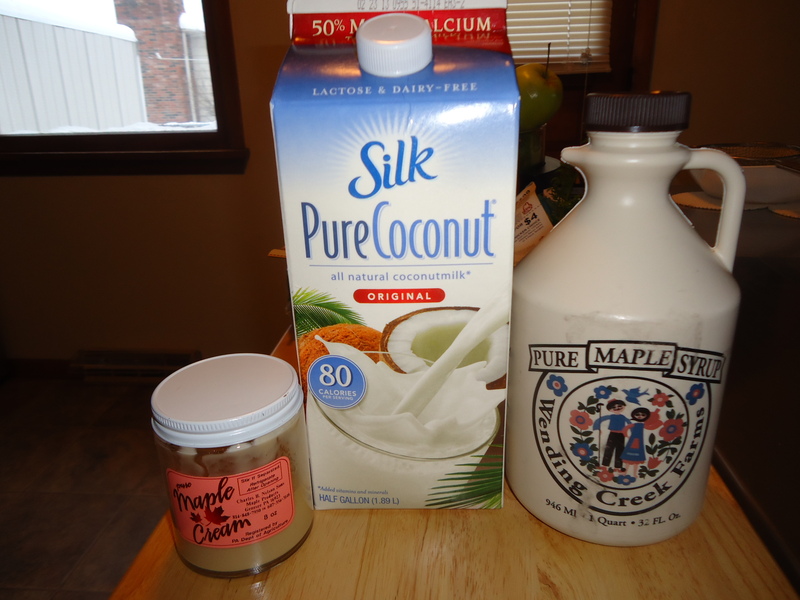 Calories saved… 1200+ since I substituted Coconut Milk for Sweetened Condensed! Add in 1/2 of the snow, using a folding move with a spoon (spatula). The snow will melt down but shouldn’t completely disappear. Keep in mind you want to not dilly dally around with this step. Most likely it’s warm in your kitchen so time against the element of warm air is of the essence. Add the remaining 1/2 of the now a little at a time. Watch the consistency and stop when you have reached a desire blend. I say this because adding too much snow can ‘water’ down the flavor overall; forgive the pun. Portion out into cups/bowls with spoons. You can choose to top with a dried seasoning if you wanted such as freshly grated nutmeg as I did. Other options perhaps could be ground cinnamon, grated candied ginger, fresh grated dark chocolate and so on. This entry was posted in Gary's Stuff, Kitchen Experiment, Main, Uncategorized and tagged Coconut Milk, maple cream, maple syrup, snow. Bookmark the permalink. Bacon Jam – too good to not pass on!